There are many things you can do to lower your electric bill, but going the extra mile to make your home energy efficient can save you hundreds per month. Here, homeowner Gerald Singleton explains how he was able to reduce his monthly bills, and drastically cut the cost of installing solar paneling to do so. "My heating bill was getting to be $600 a month, because I was running a space heater in my mother's room 24 hours a day," says the Flushing, N.Y. resident. "It just was becoming prohibitive to heat the house in the winter." Singleton, who lives in his home with his wife and 101-year-old mother, decided to take on home improvements to make his house more energy efficient. First, he hired a local company to do an "energy audit" of his home, which measures where you're losing heat and where the property is not energy efficient. After considering the audit results, Singleton ultimately decided to install solar panels. The solar paneling would normally cost a whopping $16,000, but this homeowner did his research and got 90 percent of the cost covered by federal grants and tax credits. 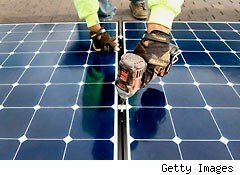 In total, the savvy saver spent just $1,600 in out-of-pocket expenses for his solar panel system, which, he says, he will recoup a little over three years. "All of these energy savings is like a form of a pension plan that provides a comfort to me that I know that I will be able to have lights on well into my retirement years, and I won't have to pay for it because I'm getting the energy from the sun," he adds. In addition to his solar panel system, Singleton bought insulating blankets for his water heater, as well as LED lights for his kitchen. At $30 per bulb, the eco-friendly option costs more, but will last you anywhere from 20 to 30 years. According to Singleton, the solar panels create one-third of the electricity his household uses. To him, making your home energy efficient is a "no-brainer."